Teachers’ Comments: An enjoyable, above average muni. 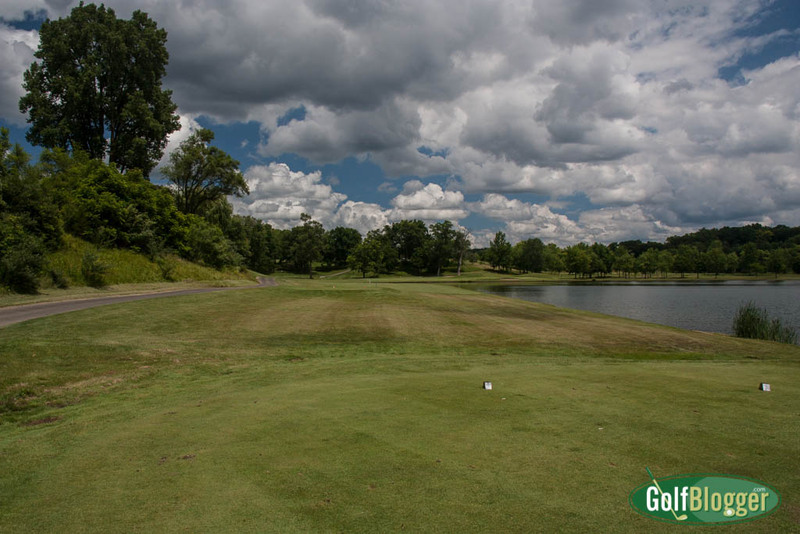 Located on the grounds of Camp Dearborn, Mystic Creek is an above average municipal course that is well worth a visit. The club consists of three nines, the Lakes, the Meadows and The Woods. I played the Lakes and the Woods on my visit. Owned by the city of Dearborn, but located in Milford (about forty miles away), Camp Dearborn consists of 626 acres of forest, lake, beaches and rolling hills. 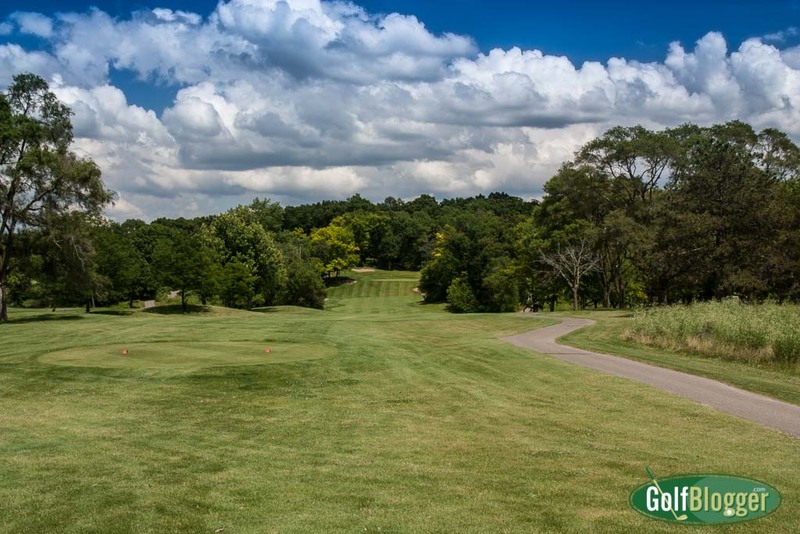 It has a half-mile long beach, campgrounds, six lakes, softball diamonds, camp sites, cabins, a heated pool, tennis courts, paddle boats and of course, golf. It is quite a beautiful facility. The Lakes and the Woods had an interesting and challenging variety of holes: doglegs left and right; uphill and downhill; through woods and over water; precision and power. The course is well laid out, and full of challenges. Architect Conroy-Dewling designs, who also designed Timber Trace in Pinckney, did good work. The first of the Lakes (above), for example, was a hole that called for two precision shots. It is a dogleg right wrapped around a neck of lake, where the first shot needs to lay up just short of the water between 160 and 200 out. From there, the next shot is nearly all carry over water to the green. If you blow the drive, there is a narrow bailout around the water, so rather than try for the heroic (and probably disastrous) shot, a smart golfer will play to work around and get on in three. The third of the Woods (above), on the other hand, called for straight power. A 511 yard par 5, it heads straight out, dips down to a stream valley, and then steeply up forty or so feet again to the green. There i’s no way to get on in two with the elevated green, so two strong shots must be followed by a powerful wedge to get your ball up to the green. This is one of those courses where I found myself using every club in the bag. In my mind, that’s a sign of a good layout. A particularly spectacular shot is the seventh on the Lakes (top of page). 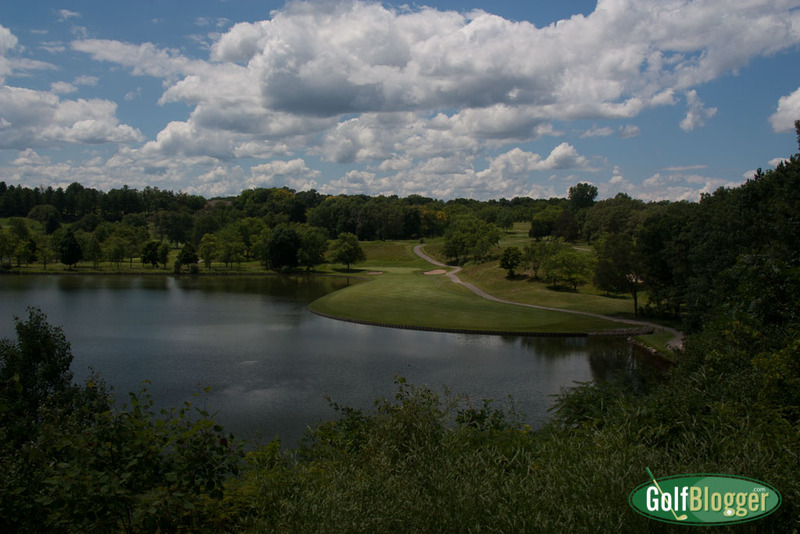 From a high tee box, it calls for a carry over a stretch of lake to a narrow fairway. From there, however, it is a relatively straight shot into the green. The carry over the water looks much longer than it is, adding to the tension. The Lakes plays 3,136 from the blues, while The Woods measure 3,232. That combination plays to a 71/137. Conditions on the day I played were about average for a municipal course. Tee boxes showed signs of heavy use, but were large enough that I wasn’t hitting out of somebody’s old divots. The fairways were somewhat weedy, but completely grown in. Low spots tended to be a bit soggy. The greens were uneven, but didn’t show any bare spots or signs of damage from the previous worst-in-a-hundred-years winter that has hammered so many other Michigan courses. Overall, though, things were just a bit “careless” around the edges. That’s something that I think distinguishes lower end and municipal courses from high-end and resort courses. The best courses I’ve played have an attention to detail that just aren’t present as you play down the scale. At Mystic Creek, for example, there were a number of random branches overhanging tee boxes, fairways and greens that just wouldn’t be tolerated on higher end courses. Unsightly forest undergrowth encroached tee boxes and fairways. I saw an old tire and a couple of pieces of random plywood on the shores of one of the lakes near the fairways. At one point, there was a cute totem pole called “Rainbow Winds – A Tribute To The Golf Gods” that was stuck in an untended patch of weeds. It was, however, still a cut above a number of the Metropark courses that I’ve played this same summer, especially in terms of the playing areas of the fairways and greens. Greens fees were about average at $45 with a cart, and $30 walking. My Michigan Municipal Golf Trail card got the walking price down to $25, which is very reasonable. You can ride on Mondays for $24. In any case, be prepared to pay an additional fee at the gate of $5 just to enter Camp Dearborn. I was a little miffed about that, as it raised the price of my round to $30. 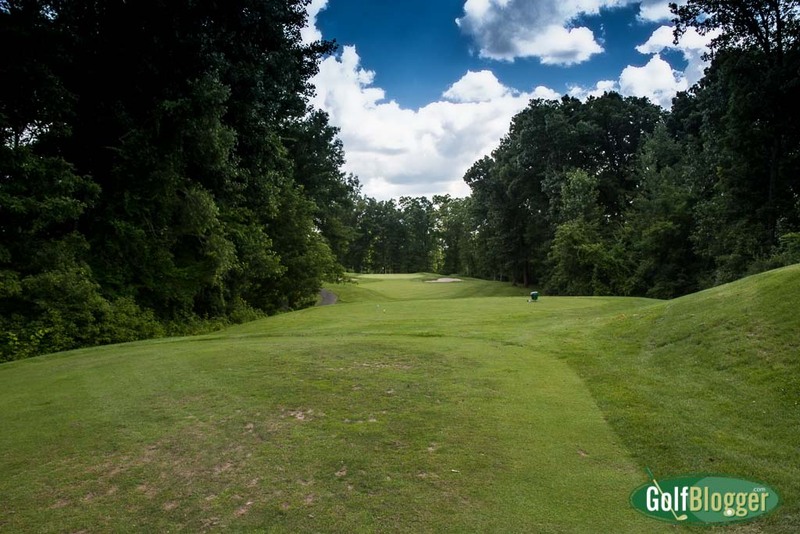 This Mystic Creek Golf Course Review was first published August 5, 2014.